Update: This giveaway is now closed. Stay tuned for news on the winner! Update 2: Winner has been announced! The Superman Chronicles Vol. 1 giveaway is closed! Good luck, guys! The winner will be announced as soon as he or she has been confirmed. Since this giveaway is on time for Thanksgiving, I wanted to find something vaguely holiday themed. I don’t think I succeeded, but Scarecrows are autumn related, right? Ah well, it’s the Batman: Scarecrow Tales trade, collecting Batman 189, 262; Gotham Knights 23; Detective 503, 571; The Joker 8; Scarecrow 1; and World’s Finest Comics 3! 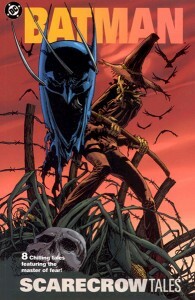 The work here ranges from 1941 to 2002, focusing on the fear obsessed criminal known as the Scarecrow! Maybe I should have posted this one on Halloween. C’est la vie, let’s run with it. (1) Winner – Randomly selected from the comments on this post. You must be registered and logged in when you comment to be eligible. You must also be in the continental USA. Deadline – You have until 11:59 on Friday, November 26th, 2010. The winner will be contacted that night or early the next morning, and announcement will be made as soon as they are confirmed. Last day to enter the Superman giveaway! The Superman Chronicles Vol. 1 giveaway ends today at 11:59 pm. I’m not sure what’s next yet, but I’ll figure it out tonight, haha. I’m off to the day job! Oh, did Harry Potter really come out today? or last night? Cause man, I totally didn’t even plan having my Books of Magic review coincide, but it’s kind of funny that it did. I guess it’s just in the air. 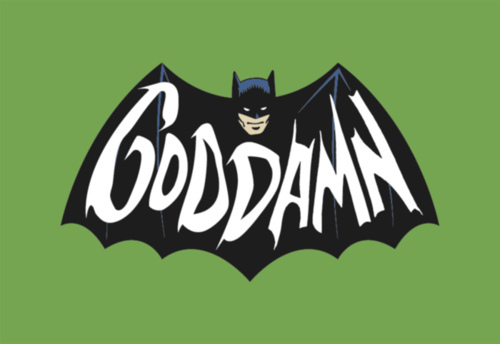 So one of our plugins was conflicting with a custom field – they both were set to “title” so when ever that plugin refreshed, it would steal/wipe all the “title” information used to display in Reviews, Giveaways, Uncle Gorby’s Corner of Free Stuff, and Comic Issue Reading Orders, as well as on the front page and in the sidebar for Reviews. I finally figured it out when it wiped again tonight (I think I’ve posted about having to reset all those titles before) and changed the custom field to be “display-title” which should keep the data separate. Of course, I still had to go in and put in all the titles again, which wasted a few hours of my time. Frustrating! Luckily, Beth had been scouring for some covers since earlier today, so we still managed to get in a real database update. For my Books of Magic review I added tags and all info to the book. Neil Gaiman is an author of no small amount of fame. This book of his has been around for some time. It’s gone into at least 8 printings in the USA alone. Yet perhaps there is something about existing in the shadow of Sandman, because I’m constantly surprised when people tell me they’ve never heard of The Books of Magic. Since we’ve been chatting about it a little this week, I figured the original miniseries deserved a more detailed look on our site. 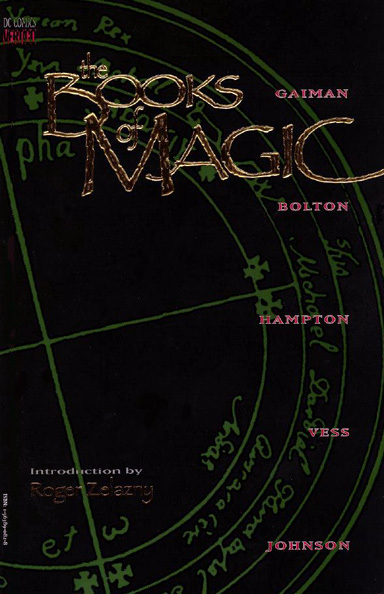 This collection is comprised of the four Books Of Magic prestige comics released in the early 90s, along with an acknowledgment by Gaiman and introduction by Roger Zelazny. 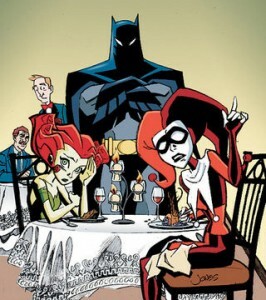 The first issue collected here features art by John Bolton. Scott Hampton‘s work graces the second, the third volume is painted by Charles Vess and Paul Johnson crafts the final issue. Still, if this is your first time with this book, I’d skip right to the comic. You’ll be aching for more when you’re done, and then you can turn to the front and read the introduction. And then read it all again. This is the first time I’ve read this book in far too long. I remember first picking it up before I was heavily into collecting – not this same copy, a beat up fifth printing that smells slightly of magic or maybe old cigars, but one similar. I had just finished reading Sandman in trade and like so many other teenage fans rediscovering the medium, I would have read an illustrated vacuum cleaner repair guide if it had Gaiman’s name on it. This particular book might be the most important of all of his, at least to me personally. Sandman was extremely enjoyable, and is widely known to be a classic. But while this book shares much with Sandman, it’s also a bit of a trap. Gaiman’s other work is rooted in the DCU, and interacts very often if you know what to look for, but this book could be considered his version of the History of the DC Universe. On one level, it’s fairly straightforward. It’s the story of Timothy Hunter, a young boy in the UK who may grow up to be the greatest wizard who ever lived. A group of older magic users gives him the choice of guidance, he takes it and is whisked off to the corners of the world to see what potential magic has – and learn the risks taken and prices paid by practitioners of the mystic arts. Gaimain writes this story in such a way that it should be enjoyable to any reader. Tim is a lovable snot, sarcastic and straightforward in all the right places, and full of awe when the moment does deserve it. The sights are fantastical and unexpected, everything you’d expect of his journey and much that will surprise you. His guides possesses unique personalities along with their humorous shared traits – mainly a pulpy penchant for trenchcoats. This story is also a well researched tapestry of existing mythos – both that of T.H. White and a plethora of fables, but also that of the DC Universe. In a story that flows in an incredibly natural fashion, Gaiman takes characters created across decades and places them throughout settings explored by the authors of DC’s rich history. Appearances are made by many, The Warlord through Boston Brand, some with bigger roles to play than others, but none seeming out of place. 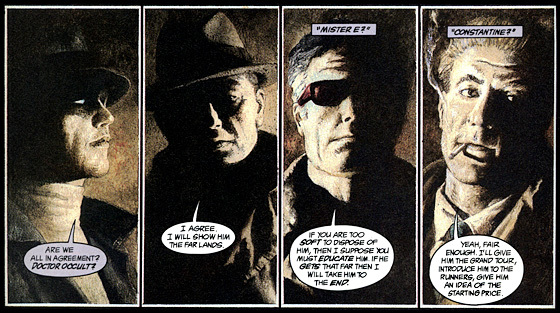 The aforementioned Trenchcoat Brigade is none other than The Phantom Stranger, John Constantine, Mister E, and Dr. Occult – well trod magical heavyweights of the DCU, some more well known than others, all picked perfectly. Besides being spot on character the entire story, these four each manage to grow much more interesting for their appearances in this short volume. It’s very impressive. I remember my original exposure to this book feeling full of mystery, enticing me further. Reading it again, with my now obsessive knowledge of DC’s backstory, was pure pleasure. You may fear that four different artists handling one story would be a jarring experience. In fact, it works perfectly. Gaiman has done us a service by striving constantly to stress the subjective nature of magic, of reality in stories. The artists here have different styles, each suited very well to the leg of Tim’s journey that they handle, but even within their segments effort is made to keep things shifting. Different characters have distinct visual cues. Historical views on the nature of magic are expressed visually. Each setting is treated with aesthetic ingenuity. A shift in mood is startling and exhilarating. The art here is breathtaking. Bolton’s speckled paintings lend grit to the British streets and ominous atmosphere to shadowy theaters, smokey rendezvous, and dark swaths of night sky. 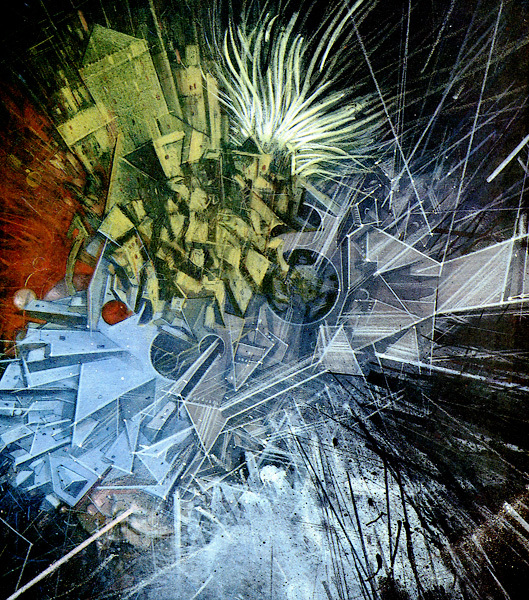 His versatility as an artist is evident through historical renderings of various moments in the long history of magic – each in the style of the expressed culture. Hampton brings us moody watercolors of many magical characters. An awe inspiring Spectre, stoic Dr. 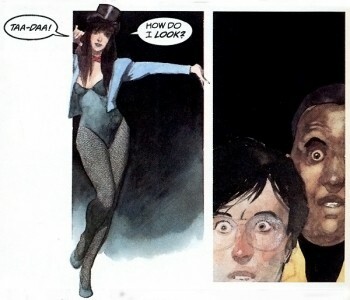 Fate, bubbly Zatanna, a whole nightclub full of queens of evil and black magicians, and various weird (and often hilarious) cameos of Boston Brand, who I first encountered here and later became one of my favorite characters. The next book takes us into Faerie, and Vess displays a decidedly different approach. Just as nuanced, but seeming a bit more lighthearted, with solid lines and bright colors. It’s a trick of course, like you should expect from faerielands, and this chapter contains its fair share of drama. Finally, Johnson displays a remarkable amount of stylistic versatility as the book spirals towards its final climax. 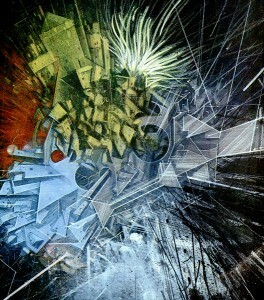 His work here is as much a love poem for modern art as the mystical arts. Gaiman, along with these fine artists, could have let this be a rather humdrum tour, with plenty of beautiful sights and amusing references, but everything speeds along, falling apart and coming together with a vibrating snap. If only every history lesson could be so brimming with life. 5 out of 5. This is a classic and deserves your attention. Where’s the absolute edition, DC? Yes. It’s a perfect companion volume to several DC titles, introduces the main character of an amazing ongoing, and eloquently expresses a variety of theories as to the nature of the DC universe. Alan Moore’s run on Swamp Thing (especially the crossover with Crisis on Infinite Earths in A Murder of Crows) is thematically similar and introduces some characters here. 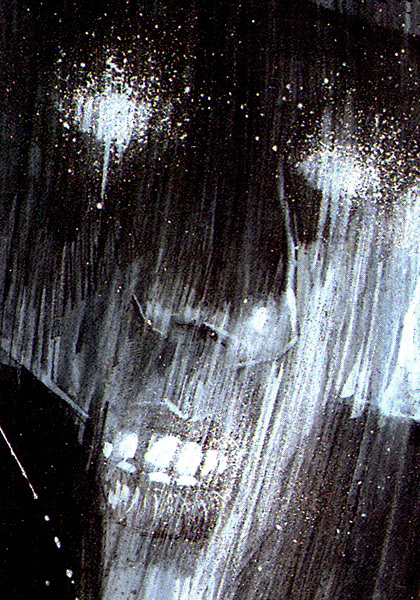 A healthy acquaintance with Hellblazer could also fortify your enjoyment. The Phantom Stranger Showcase Vol. 1 we talked about previously. 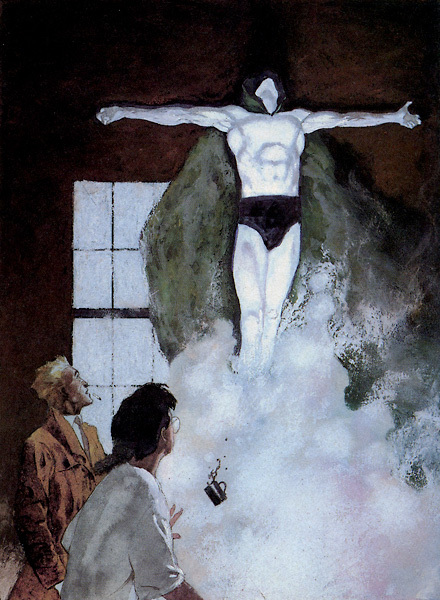 Neil Gaiman‘s Sandman is a technical precursor, with this book taking place after roughly 20 issues had been published and featuring some familiar faces. However, you can dive right into this story. None of these titles really need to be read in a particular order, though following the Vertigo Universe timeline can work pretty well. Any and all of the above. One of the wonderful things about this book is that there are so many places to explore next. 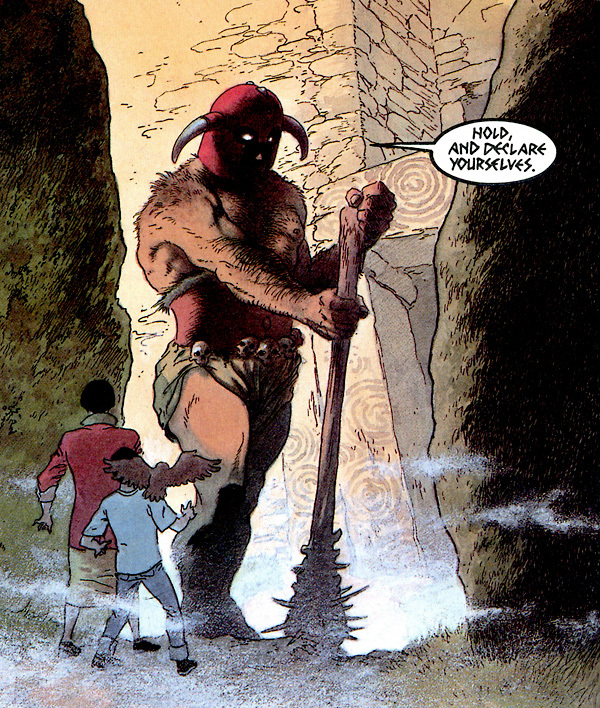 Lucifer, another excellent title (which continues from Sandman.) The Deadman Collection for those interested in Boston Brand. 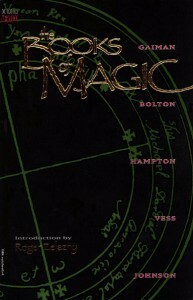 And of COURSE the Books of Magic ongoing, which is a very satisfying continuation of Tim Hunter’s story. Unfortunately, the Trenchcoat Brigade miniseries remains uncollected, but there is plenty of John Constantine out there. Hi everyone! Ian’s been showing me some ways I can help out with the site when I have spare time. Teen Titans Go! Truth, Justice, Pizza! Teen Titans Go! Heroes On Patrol! Teen Titans Go! Bring It On! Teen Titans Go! Ready for Action! Teen Titans Go! On The Move! Teen Titans Go! Titans Together! Teen Titans: Jam Packed Action! Edit: Ian update – sorry, I didn’t actually get this up until Friday morning, really, as I had to deal with some other bug fix stuff, to be mentioned in the next update.